Wyoming offers several universities and colleges for students who are interested in receiving the education they need for a rewarding career. Before settling on a specific school, it’s a good idea for students to weigh their academic options to ensure that their program of choice will get help them reach their specific academic goals. On this page, we list some of the information prospective students need when looking for online colleges in Wyoming — such as the importance of finding an accredited school, how to find financial aid, and the ways students can earn credit from their work and life experience. Many factors go into choosing an online program in Wyoming. For some students, access to disability support services may be a key variable, in which case they might choose Casper College for their support services. For other students, access to tutoring makes Eastern Wyoming College an attractive choice. Finally, those hoping to take advantage of an online writing center may enroll in a program at the University of Wyoming. 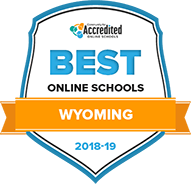 No matter what prospective students look for in an online school in Wyoming, the rankings of the best schools listed below help students begin the research process and understand what each school offers. See if any of the top colleges in Wyoming are right for you below. All degree levels - bachelor's, master's and doctoral - are available online at the University of Wyoming. Certificates, endorsements and professional development courses are also available online for students not pursuing full degrees. Course formats are flexible, with options like correspondence study and semester-based independent learning, and students can seek in-person guidance at any one of 8 UW distance locations scattered throughout the state. A full menu of student resources is included in the cost, and scholarships and financial aid are available to eligible students. How can I find which online colleges offer the degree I'm looking for in Wyoming? Future online students in Wyoming can find information about specific programs by going directly to different schools' websites. In some cases, they may need to search to find out whether they can enter a specific program online; in other cases, schools list all of their online programs on one distance-learning page. For example, those interested in attending Eastern Wyoming College or Casper College can easily find these schools' online programs listed in one place. Which online schools in Wyoming will accept my transfer credits or work/life experience? Each school will have their own requirements and specifications for earning college transfer or work/life experience credits. Common academic credits for transfer students or those seeking credit for work/life experience include military service credit or credits transferred from an institution or program of equivalent quality. Some schools also offer credit by examination at the departmental level, CEEB-AP or CLEP programs. For reference, Casper College breaks down these credits by type, with requirement explanations. Before settling on a school, it’s a good idea for students to reach out to their college of choice and verify their requirements for transfer students and credit for work/life experience. How Much More do College Grads in Wyoming Make? When people complete a college degree students can increase their earning potential later in life. In fact, people with no formal education earn at least $20,000 less annually than those with a college degree. For more information about how education level influences earnings in Wyoming, review the chart below. This data from the Bureau of Labor Statistics only tell part of the story concerning why workers in Wyoming should earn a college degree. Although currently, about 40 percent of people in the state hold at least an associate degree, employers' demand for college graduates continues to rise. According to the Center on Education and the Workforce, by 2020, 65 percent of jobs around the state will require a college education. Therefore, earning a degree will prove even more necessary to competetively land a position in the future. Accreditation ensures that students who enroll in online schools in Wyoming receive a quality education that meets high standards. As a result, students should only consider schools accredited by the Higher Learning Commission (HLC), such as the University of Wyoming and Central Wyoming College. When colleges go through the accreditation process, the HLC evaluates them based on their curriculum, finances, administration and resources. Just as the University of Wyoming holds accreditation from the HLC for its quality, specific programs at the school also hold accreditation from specialized accrediting bodies. For example, the school's dietetics degree holds accreditation from the Accreditation Council for Education in Nutrition and Dietetics, the music program holds accreditation from the National Association of Schools of Music, and the engineering programs hold accreditation from the Accreditation Board for Engineering and Technology. Wyoming boasts a reputation for offering affordable higher education to both in-state and out-of-state students. In fact, according to Forbes in 2013, Wyoming held the lowest in-state tuition in the country and the second-lowest rate for out-of-state students. Data from the National Center for Education Statistics show that in the 2015-2016 academic year, private school students in Wyoming paid $18,021 for tuition, while their counterparts at public colleges paid a $4,178 in-state rate and a $12,770 out-of-state rate. While some online schools charge a lump-sum tuition rate, other schools charge a per-credit rate. For example, Casper College charges in-state students $128 per credit and out-of-state students $316. In addition, Wyoming residents who attend Northwest College pay $94 per credit and students from other states pay $282. Students from certain states who want to attend Wyoming colleges can, however, receive a discount. Schools that participate in the Western Undergraduate Exchange allow students from several states (Nevada, Montana, Washington, California, South Dakota, New Mexico, Utah, Alaska, Oregon, Arizona, Idaho, Colorado, North Dakota, and Hawaii) to receive a discount on their tuition. For example, eligible students can pay $141 per credit at Northwest College and $175 at Casper College for each credit they take. For additional information on paying for online colleges in Wyoming, review the following Q & A. What are Wyoming's requirements to qualify for in-state university tuition? After living in Wyoming for one consecutive year, students can qualify for the in-state university tuition rate. Learners must demonstrate that they intend to make Wyoming their permanent home by registering to vote, getting a driver's license or state identification card, and registering a vehicle. Are online credits more affordable in Wyoming than other places? The per-credit rate that students pay in Wyoming costs less than what people pay in other states. For example, while Casper College students pay $128 per credit and Northwest College students pay $94 per credit, those who attend the University of Montana pay $222. Similarly, credits at the University of Nevada, Las Vegas cost $224 each. How can I get help paying for online college in Wyoming? Even though students in Wyoming can save a significant amount on tuition compared to students from other states, they still need to consider keeping their costs down to avoid taking out a lot in loans. To begin the process of qualifying for grants and scholarships, students should submit a Free Application for Federal Student Aid, or FAFSA. The FAFSA allows schools to evaluate whether students qualify for the several scholarships geared toward Wyoming residents. Cody Youth Council Scholarship:This scholarship goes to high school students graduating from Cody High School and Heart Mountain Academy. Applicants need at least a 2.7 GPA. Wyoming Hathaway Scholarship:This is a needs-based award for students at the University of Wyoming or a community college in the state. Ellis and Nellie Patch Scholarship:Students from Johnson County with at least a 2.0 GPA qualify for this one-year scholarship of $1,500. The deadline for application is mid-February each year. Myron D. Kiesling Scholarship:This scholarship caters to those hoping to study nursing or engineering at a Wyoming school. Applicants must be graduating seniors from Upton and Newcastle High Schools with a 3.0 minimum GPA. Hayden Huston Centennial Scholarship:The Wyoming Community Foundation provides this scholarship to graduating Pinedale High School students with at least a 2.5 GPA. Just as students who attend college can lay the foundation for a new career, adult education programs serve as another avenue that people can take to train for a job. In fact, according to the U.S. Department of Education, from 2016 to 2017, these programs helped 1,764 Wyoming residents from various backgrounds get a better education. Sheridan Workforce Center, which provides job search services for dislocated workers, counts itself among the state's available adult education programs in Wyoming. Similarly, Rock Springs Workforce Center helps at-risk youth who need job training.